Most small retailers don't have a moment to spare. And neither did Glenn McKee when he got the call about going to Washington, DC to talk with Minnesota's elected officials about the proposed border adjustment tax a month and a half ago. But McKee, owner of several Games by James and Air Traffic stores, decided to take a few days away from running his business to tell his real life story about how the proposed high import tax would negatively impact his suppliers and ultimately his customers. McKee's efforts and those of many other retailers produced important results last week when an influential group of legislators announced that the border adjustment tax had been dropped from the federal budget plan. 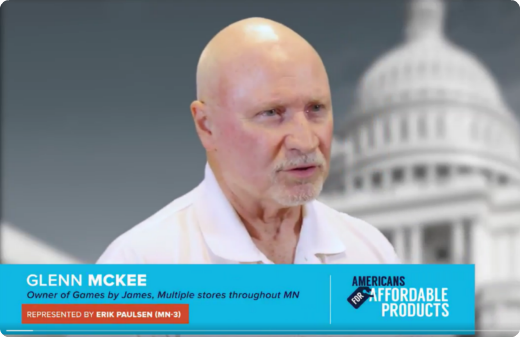 Following an initial visit to DC in June, McKee made a second trip a week later, and a third just two weeks ago to deliver the message that the border adjustment tax threatens to damage retailers of all sizes with noticeable impacts on communities across Minnesota. "If you don't think one or two or three or 10 conversations can make a difference, try telling that to Glenn McKee" said Minnesota Retailers Association president Bruce Nustad. "The pressure to pass the border adjustment tax was tremendous, but voices like Glenn's made a made a huge difference in this conversation. We are so grateful to Glenn and others." "In the beginning I questioned how my voice as a retailer in Minnesota could impact on this conversation", said McKee in reaction to the announcement. "But it turns out delivering the straight story and helping those that are elected to represent us understand this issue had a deep impact. I feel like I made a difference." Glenn McKee, owner of Games by James and MnRA Board member, along with Devee McNally and Julie McAdam of Madesmart in front of the U.S. Capitol after paying visits to Minnesota's federal elected officials in opposition of the border adjustment tax.